This is a tale of two cultures describing how one Indian family moved from a nomadic existence into the modern world and resisted extinction. A picture show the bronze; six meter high Statue of Freedom on top of the U.S. Capitol Building. This statue was conceived in 1855, the year of the Yakama Indian War, and is a visual symbol of the evolution of America. The female body indicates justice, the military helmet is self-evident, and the eagle's head, crest of feathers, and native blanket are American Indian. And, finally, the statue faces East, the first direction of the American Indian Medicine Wheel. In 1990 fellow councilmen Dale Kohler, Gene Joseph and I noticed this statue on top of the Capitol Dome that looks like an Indian woman in a helmet covered with feathers. 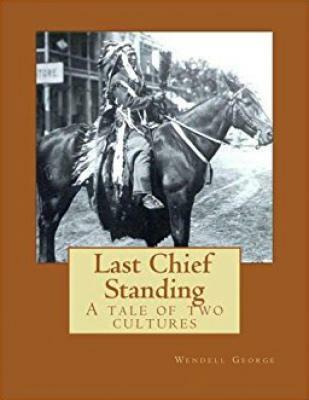 I didn't realize the significance of this until i read the book by Jack Weatherford given to me by me son, Kerry, called Indian Givers. She is an inadvertent memorial to Indians that personifies the subtle way our culture has been infused into society. That is why I used it as a theme for this book. Seven generations back my ancestors were faced with basic survival. As they evolved their problems became more complicated bu their ability to solve them increased. What each generation learned is passed on to the next generation. The accumulation of ideas and the growth of native ability to adjust to the changes increased at a faster rate with each generation. The seventh generation is at the peak of that cycle. The eighth generation will be starting over at a new level much higher than the previous cycle. The story begins with a vivid description of the infamous Manifest Destiny which decimated the native tribes. The story has been told before but mostly by historians, not Indians. My family lived a competitive but relatively peaceful life for untold generations before the white settlers came. When the northwest was finally discovered and opened to settlement the next few generations met and contended with the intrusion of the new immigrants. The last five generations of grandparents lived through major changes to their life style. The ways of modern civilization were not compatible to their old ways, forcing them to learn a new approach to living. But they desperately tried to merge the new with the old. They did not want to lose what had enabled their people to exist for thousands of years. In doing this they discovered themselves. It is the first time they had to look deeper for the reasons they did what they did. Before that they just did what their ancestors did, no questions asked. Then in a more contemporary time my Great-grandfather, Chilcosahaskt, found himself in the middle of a whit settlement that tried to force him to move. He refused to move and spent the remainder of his life on his ancestral grounds. As soon as he passed on the settlers used their legal means to take the land. This was repeated over and over with the largest land grab at the Yakama treaty of 1885 which my grandfather, Lahompt, witnessed. The transition is dramatically illustrated by my dad, Moses, who was the last of the family to be born in a tepee and the first to father a college graduate, me. The tribe survived and thrived by developing their natural resources. I gave up a promising career in private industry to return and help my tribe develop their resources. They are now the largest employer in the area. Emphasis on training and education is preparing them for a much faster paced life. They are like the mythical Kokopelli leading us into the next world. Although we had difficulties making this change, our tribe adjusted not only to survive but to flourish. The economy is no longer a direct line pursuit of food. Instead, it is through full-time careers and paychecks. Today we use jet airplanes instead of horses and legal arguments instead of guns. Battles are through negotiation and paper trails. We have come full circle. The Indian Way is coming alive.